NEWS REPORT: The Montenegrin champions have made clear their plans to remain a top European team with a series of key contract extensions. 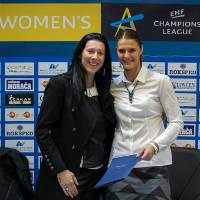 Women’s EHF Champions League club Buducnost have re-signed six of Europe’s most sought-after stars to extended contracts – completing a season’s worth of work in a single day. Right back Katarina Bulatovic, left back Cristina Neagu, line player Dragana Cvijic and left wingers Majda Mehmedovic and Biljana Pavicevic have all signed new one-year contracts, while goalkeeper Marta Zderic will remain in Podgorica until the end of the 2016/17 season. “It is a principle that should be done,” said Buducnost sporting director Bojana Popovic. “Before the start of the Champions League Main Round the players should have a clear picture ahead of next season. “Now, they can think only about the coming challenges in the Champions League, and not be burdened about negotiations with other clubs. “We are pleased that in the past few years we have assembled a team in time for the next season, keeping the best players." Bulatovic returned to Buducnost in the summer of 2014 following two seasons with Romanian side Oltchim Rm. Valcea and Hungary’s Györi Audi ETO KC. The 30-year-old is delighted to have signed a new deal with the club where she won the Champions League in 2012, particularly after being named Montenegro athlete for 2014 - the second time she has won the award. “I'm glad we easily agreed to continue our cooperation,” said Bulatovic. “I am happy to stay in Buducnost next season, it’s an honour to play in a team with so many great players. In this club I feel at home and I have plenty of motivation for next season to be at the highest level again. One on the main tasks facing Buducnost management was to keep Romanian Neagu, who is playing her second season for the club. The 26-year-old is currently Buducnost’s top scorer with 41 goals, tied for second place on the EHF Champions League top-scorers list. Neagu said: “Behind me is a difficult period, that’s why I was thinking about what's best for me. I made a decision and I'm happy to stay in Buducnost. “I am satisfied with the cooperation with my teammates, conditions in the club and atmosphere that is at the highest level in every aspect. “I believe that with this team I can fulfil all my goals, we are all together always want to be better and at a higher level. “Our desire is to qualify for the FINAL4, and then to fight for the Champions League trophy." It is not all one-way traffic at Buducnost however, with two players potentially heading for the exit. Goalkeeper Clara Woltering appears set to move back to her native Germany with the media in Montenegro reporting that Brazilian Chana Masson is due to take her place, although the club are yet to confirm this. But one player’s departure has been completed as, after two seasons in Podgorica, Danish right back Camilla Dalby is returning to Randers HK, after signing a three-year deal with her former club. It is expected that her move will pave the way for Montenegrin prospect Djurdjina Malovic to gain greater exposure to the first team. "I've had two good seasons in Buducnost and have learned a lot during that period,” said Dalby. “At the same time, I am happy to return to the club I left, the club where it all started and where I've had so many good experiences. “I look forward to being able to contribute again, and look forward being part of an exciting squad in Randers HK, and to play in the blue sweater again.